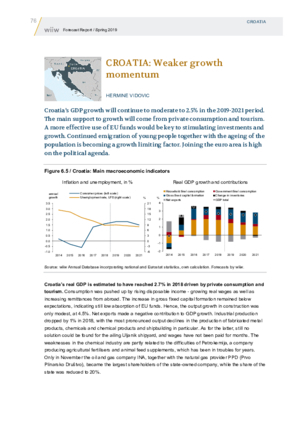 Croatia’s GDP growth will continue to moderate to 2.5% in the 2019-2021 period. The main support to growth will come from private consumption and tourism. A more effective use of EU funds would be key to stimulating investments and growth. Continued emigration of young people together with the ageing of the population is becoming a growth limiting factor. Joining the euro area is high on the political agenda.